Warm greetings to you all and Happy New Year. Now the Christmas buzz has died down it’s been all go for New Year. This year I celebrated in style with a special celebration tea from Japan called Obukucha with Gold Powder from Yamane-En as sold via Yunomi. It was purchased earlier in the year as means to celebrate my birthday though traditionally it is used around the New Year. Taken from the Yunomi website. In 951, there was an epidemic in the region, and a priest named Kuya offered tea with ume to those suffering from the disease helping to decrease the severity of the epidemic. 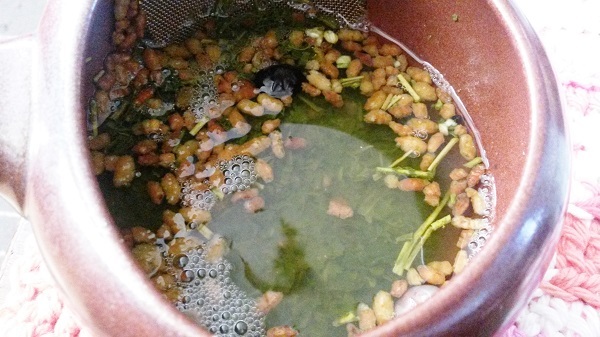 Soon after this incident, it is said that Emperor Murakami drank this tea at New Year’s; and because the emperor drank this tea, it was named kofuku-cha 皇服茶 (ko 皇 meaning emperor, fuku 服 meaning to drink). 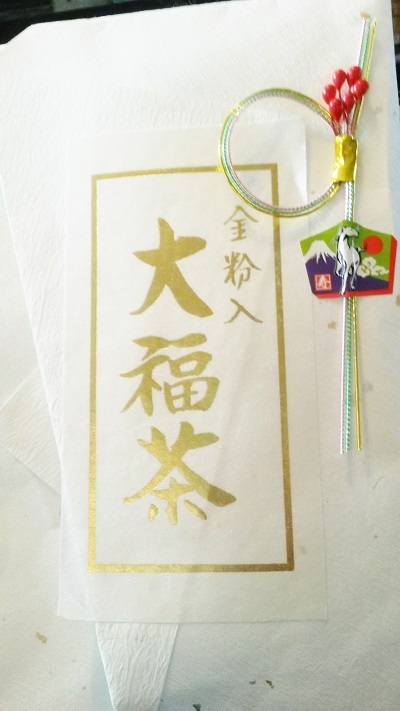 The word ‘kofuku 幸福’ also means happiness or good luck and that is where the name obukucha 大福茶 (o 大 meaning big, fuku 福 meaning luck) comes from. This specific tea has gold powder (edible gold flakes), a perfect cup of tea to be served at celebratory occasions such as New Years or birthdays. This tea contains: sencha tea leaves, genmai (brown rice), black soybean, white beans, matcha, sliced kelp and edible gold flakes. Such an adventurous blend and my reason for purchase. Plus as you can see the packaging design was rather cute. I’ve never bought tea before that came with what I can only assume is a good luck charm on the packet. In appearance the first thing I was looking for was the edible gold flakes, and I didn’t have to look far. There are lots of little gold pieces dotted around the blend. Other than those it’s an interesting mix of ingredients ranging from large, to small to powder. 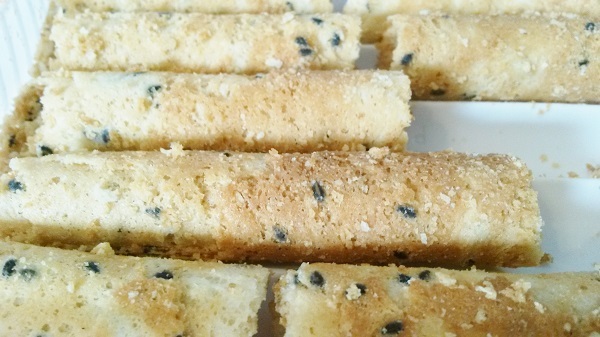 It has a toasted grass scent that is sweet yet very savoury. Scent Notes: The Genmai is strong with this one, it’s very toasted and rice/bread like. All with a grassy and rather fresh green tea to lighten it. Flavour Notes: It tastes as toasted as it smells and is very savoury. The beans come through for an interesting flavour too. A little dry though not in a bad way. The Matcha is also noticeable in a grassy way. 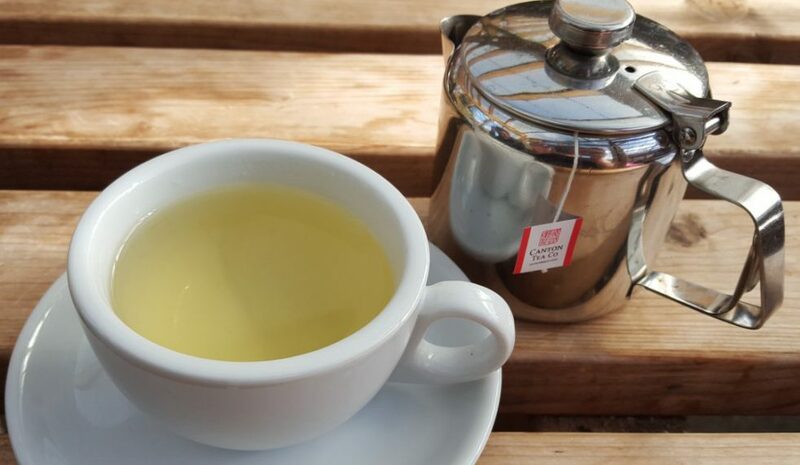 The Sencha adds some sweetness though only a minimal amount due to it’s savoury nature. 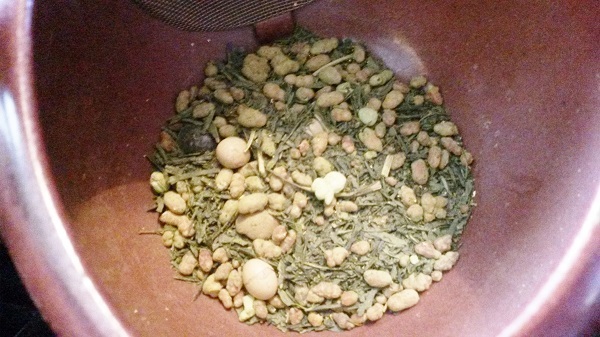 I would say that fans of GenMaicha should like this one. It re-steeps well, each serving has at least three steeps in it before it becomes too weak. Also is a little bitter but in a savoury way, it’s more than acceptable. 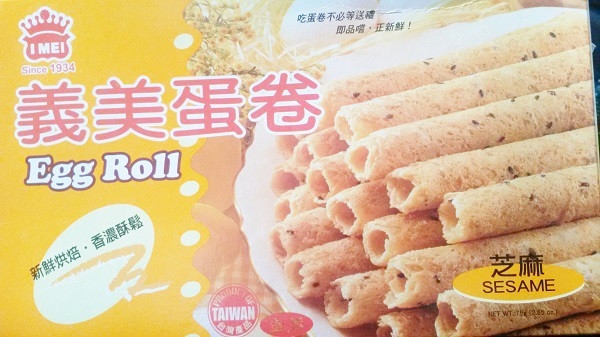 Was the perfect tea to accompany these Egg Rolls that a friend sent me from Taiwan. They were tasty! While pulling up the information for the Obukucha I noticed that Yunomi are offering two sizes of Fukubukuro which literally translates to ‘happy bags’. We (Westerners) may refer to the like as ‘lucky bags’ ie lucky dip. They can be seen all over Japan during the New Year celebrations and make wonderful gifts. Tea Fukubukuro 300+ features 300 grams or more (around 3 bags), with a total retail value of over $50. (Shipping cost charged at 250-gram rate, and differs by region.) Shipments begin January 5th. Tea Fukubukuro 500+ features 500 grams or more (around 5 teas), with a total retail value of over $100. (Shipping weight is registered as zero, so you only pay the $3.00 handling surcharge on the order.) Shipments begin January 5th. I’ve treated myself to the fukubukuro 500+ and I can’t wait to see what I get. I will share it with you when it arrives. 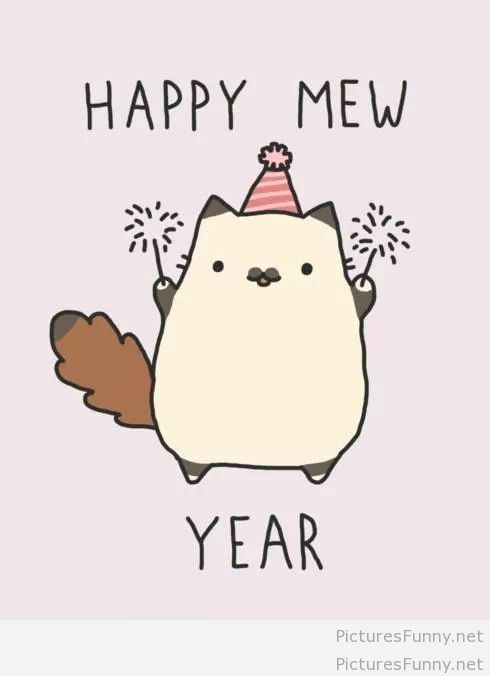 Until next time, this is Kayleigh of KittyLovesTea wishing the New Year brings you all peace. 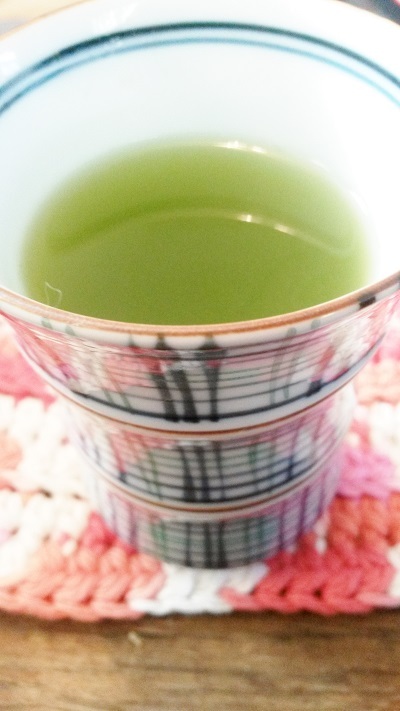 I am happy to see you had a little of a Japanese styled New Year with Obuku-cha and fukubukuro pleasure. The “good luck” charm on the package is called “noshi” in Japanese and usually is added on presents or gifts to make it more valuable. It’s a beautiful decorational item with a long history here. Happy New Year and wow I want to try this tea. 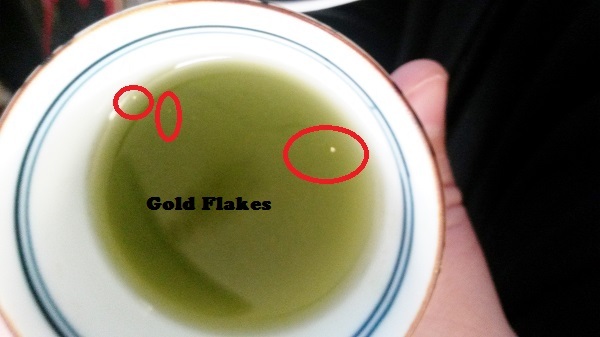 Gold flakes? You had me a gold.